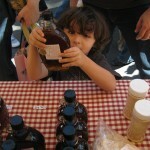 We sell our maple syrup, fine maple candies, and other maple delectables at the Union Square Greenmarket in New York City every Friday and Saturday throughout the year. 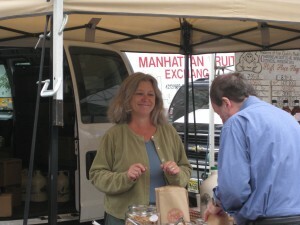 Deep Mountain Maple has been a proud part of the NYC Greenmarket since 1985. We are now celebrating our 26th year at Greenmarket! We generally take a few weeks off around Christmas and the New Year, and maybe the 4th of July. 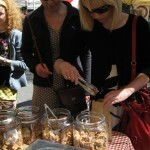 Other than that, you’ll find us in the Union Square market every week, come rain, shine, or snow. 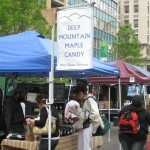 The Deep Mountain Maple “store” is actually one of many wonderful farm stands at the Union Square Greenmarket. 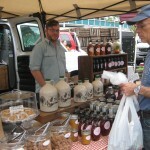 While most Vermont sugarmakers sell their products wholesale or by mail order, we have been making the long trek to New York City and the Greenmarket urban farmer’s market weekly, for 25 years. We believe in the real market place, where people from all walks of life, country and city, rich and poor, come together to not only buy food, but really to celebrate food and get to know the people who produce what they eat. Greenmarket is the largest system of outdoor, urban farmer’s markets in the United States. 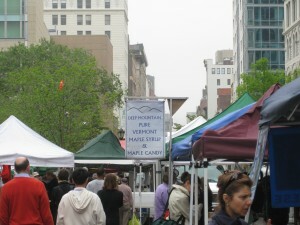 The Greenmarket organization, a program of the Council on the Environment of New York City, opened its ‘flagship’ market at Union Square in 1976. Since then, the Union Square Greenmarket has become an internationally–recognized landmark in its own right, contributing significantly to the rebirth of the Union Square neighborhood over the last three decades. There are currently more than forty-five other Greenmarket sites, located in all five boroughs of New York City. Greenmarket is strictly a producer’s market; that is, in order to participate in the Greenmarket, you must actually grow, raise, cultivate, or collect whatever you sell. From its own mission statement, Greenmarket’s purpose “is to promote regional agriculture and ensure a continuing supply of fresh, local produce for New Yorkers. Greenmarket supports farmers and preserves farmland for the future by providing regional, small family farms with opportunities to sell their fruits, vegetables and other farm products to New Yorkers.” With over 200 farmer participants, it is estimated that well over 30,000 acres of farmland are preserved directly because of the Greenmarket. The markets are fully funded by the growers who participate in them. The cost to the taxpayer is zero. You can enjoy Deep Mountain Maple Syrup maple in any of the four Vermont maple syrup grades — from lightly golden and delicately flavored to dark, hearty, and robust. They are all available throughout the year at our Union Square location. 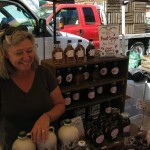 We produce and package our maple syrup in a range of sizes and containers. 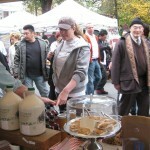 At Union Square we also sell pure maple cream, granulated maple sugar, flavored maple syrups, fine maple candies, and other maple confections. Check for our ongoing announcements about what is available at the market this week. We do not ship our maple products. For our restaurant customers, we can arrange delivery in Manhattan, and to parts of Brooklyn, Queens, and Vermont. Our stand at the Greenmarket is our main sales outlet. We look forward to seeing you there.